Sen. James Inhofe (R-Okla.), speaking after a hearing in which he and other GOP lawmakers questioned Obama's authority to enter into even a voluntary U.N. climate deal, said he expects to follow up with legislation. But, he acknowledged, there is probably not much congressional opponents of reducing carbon emissions can do to stop the Obama administration from signing onto the agreement expected in Paris this December. 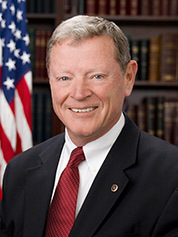 Sen. James Inhofe (R-Okla.). Photo courtesy of Wikipedia. "They're going to tell [the international community] that they don't need to have ratification. I can't stop him from doing that. But we can stop us from living with an agreement that we're not a part of," Inhofe said. His solution to meeting the U.S. pledge? "Just don't do it." The hearing before Inhofe's Environment and Public Works Committee opens up the newest front in Republicans' Paris offensive. It comes as the Obama administration fends off riders from House appropriators aimed at blocking U.S. EPA from implementing regulations on new coal-fired power plants. The Clean Power Plan rules, which the administration insists it has the power to enact without congressional approval under the Clean Air Act, are at the heart of Obama's pledge to cut emissions 26 to 28 percent below 2005 levels by 2025. While the rule has long been under attack in the courts and from some members of Congress, lawmakers yesterday focused on undermining the international community's trust in the Obama administration. Republicans repeatedly declared the U.S. climate goal unrealistic and Obama's authority to avoid Senate ratification and unilaterally seal a global deal -- even one that falls short of a full-blown treaty -- questionable. "The American people are getting frustrated that we have an individual enacting policies that are affecting their everyday lives ... based on legal theories that are so tenuous that they are to be almost breathtaking," said Sen. Jeff Sessions (R-Ala.). "It seems to me, the power of the purse remains the only realistic option." Inhofe said the international community needs to know that the U.S. carbon-cutting plan is "unrealistic" and the measures put in place will not be enough to meet Obama's goal. Meanwhile, he said, any agreement the United States enters into in Paris "does not have the backing of the U.S. Senate." It remains unclear, though, whether countries are indeed being scared off by that message. Diplomats have acknowledged that they and their constituents are worried that unless the Paris agreement is internationally legally binding, a future Republican president could undo Obama's pledge (ClimateWire, April 24). But as of yesterday, leaders from countries most vulnerable to climate change said that while Republican opposition to keeping their nations safe is disheartening, it won't derail a deal. "The new climate change agreement currently being negotiated is likely to be finalized in December in Paris. The rest of the world is well aware of the fact that President Obama cannot secure support from Congress for it and hence that fact has already been factored in," said Saleem Huq, director of the International Center for Climate Change and Development in Bangladesh. Ronald Jean Jumeau, the Seychelles' ambassador to the United Nations, said countries are still falling short of the emissions cuts needed to keep global temperatures at levels considered safe for small island nations like his. Jumeau called on the United States and others to do more, adding that the biggest polluters have an obligation to lead. "It would be unacceptable and even shameful for any major emitter, especially among those most responsible for climate change, to ride on the backs of the poor and weaker countries, especially those like the [island nations] which are the least responsible for, but which will suffer the most from, climate change. "It is unacceptable to say that a [pledge], which is already inadequate, is too difficult or impossible to implement, or unattainable at a time when for many countries everything is at stake," he said. Whether the United States can actually meet its goal -- known in U.N. parlance as an "intended nationally determined contribution," or INDC -- is the subject of competing analyses. Karl Hausker, a senior fellow in the climate program at the World Resources Institute, testified yesterday that the goal is "ambitious but achievable" and would also boost jobs and the economy. Meanwhile, Jeff Holmstead, a partner at the law firm Bracewell & Giuliani and a former EPA assistant administrator, and David Bookbinder, the Sierra Club's former general counsel and now a partner at Element VI Consulting, said the numbers just don't add up. "This is arithmetic. It's nothing but arithmetic," Bookbinder said, arguing that the measures the Obama administration has listed as part of its Paris plan only get the United States between 68 and 75 percent of the way to its goal. The most powerful arguments, however, came from George Mason University professor Jeremy Rabkin, who attacked the Obama administration's push for a voluntary deal that can avoid Senate ratification -- and certain failure. He said that while presidents do have some authority to make agreements with foreign nations, those have traditionally been "very specialized and very limited in their effect," while broader deals have been authorized by Congress. "What we're doing here is something that doesn't fit that pattern at all," Rabkin said. He noted that the Paris deal is expected to be an "elaborate international agreement" with specific commitments and timetables. Basically, it will have all the aspects of a treaty except Senate ratification. That, he said, would be a dangerous precedent. "If you think the president can make that kind of political commitment and the Congress is obliged to follow through, why can't he make a political commitment to the president of Mexico saying, 'This is how we're going to change immigration law?'" he asked. "Is that really the way we want to be governed?" Still, even Rabkin acknowledged that a Paris deal could be difficult to undo. "The next administration could certainly say, 'They [the Obama administration] made a political commitment, and we repudiate it. ... Of course, it's an awkward thing to do," he said, and noted that doing so could undermine international trust in the United States. "It's lamentable that Obama is putting the next president in that position," he said. Democrats, on the other hand, insisted that Obama has the authority he needs to cut a deal in Paris and that doing so is the right thing for the United States. "Frankly, the Congress is off-track," said Sen. Barbara Boxer (D-Calif.). "You're on the wrong side of the people, and the wrong side of history."